"This is the scroll of Thoth. Herein are set down the magic words by which Isis raised Osiris from the dead." More importantly, those are the opening words of Universal Pictures monster classic The Mummy. While of the big four classic Universal monster movies (including Dracula, Frankenstein and The Wolf Man), this may be the least fondly remembered, but it was one of the most important films the studio would make in the thirties. Following the success of Dracula and Frankenstein, The Mummy established Universal's prowess in horror and began some now well-known monster movie formulas. In 1921, a decade before Universal's horror boom, the real-life British Museum uncovered the archeological find of the century and perhaps the millennium in the undisturbed tomb of Pharaoh Tutankhamen. Amongst the hullabaloo over ancient treasures and gold was popular interest in "the curse." Death and misfortune (played into by news media of the day) seemed to follow the members of the expedition like a black cloud. With the Egyptian craze in full swing, Hollywood naturally wanted to carve a slice of pyramid pie for themselves and what better way to do it than cashing in on the curse with a horror movie! The project was originally titled Cagliostro and loosely based on the legend of the same-named alchemist. Screenwriter John L. Balderston (Dracula, Mad Love) grafted Egyptian imagery and mysticism onto a script that borrowed heavily from his earlier adaptation of Dracula. In many ways, The Mummy is a remake of Dracula with Boris Karloff in the title role instead of Bela Lugosi, but I'll get back to that later. The film begins appropriately enough in 1921 with an archeological expedition uncovering the tomb of high priest Imhotep. The legendary and heretofore mythical scroll of Thoth is mysteriously entombed with the priest. Upon inspection it is found that Imhotep is like no other mummy; he was interred alive! Along with the mummy and scroll is a written warning of dire consequence to whosoever disturbs the tomb. Dr. Miller (Edward Van Sloan reprising his stock vaguely European scientist character) and Sir Joseph Whemple (Arthur Byron) exit the tomb to discuss the gravity of their find, leaving the mummy and scroll with the young and exuberant archeologist Norton (Bramwell Fletcher). Norton, not heeding the warnings of Dr. Miller to proceed with caution, begins deciphering the scroll. As gods and curses are being debated outside, inside Norton begins reciting the resurrecting text. In a powerful, yet wonderfully understated moment, Karloff (in stunning and painful Jack Pierce makeup) stirs to life as the ancient Imhotep. Upon this sight, Norton is the first to fall victim to the curse and goes hysterically mad. "He went for a little walk," is how the cacklingly insane Norton explains the disappearance of the mummy Imhotep and the scroll of Thoth. Cut ten years into the future and a second British Museum expedition, led by Frank Whemple (Dracula and The Black Cat's David Manners) the son of Sir Joseph Whemple, is coming up short. Enter a mysterious Egyptian calling himself Ardeth (Our Death?) Bey with definitive proof of the whereabouts of the lost tomb of Princess Anckes-en-Amon. Who is this Ardeth Bey and why does he know a secret as ancient as the location of Princess Anckes-en-Amon's tomb? The Whemples and Dr. Miller soon find out when Imho - I mean Ardeth Bey (heh, heh) takes more than a passing interest in the beguiling houseguest of Dr. Miller, Helen Grosvenor (stage actress Zita Johann). Ms. Grosvenor, it seems, is of Egyptian heritage and as we find out has more ties than mere nationality with the deceased Princess Ankes-en-Amon. As Imhotep and Adeth Bey, Boris Karloff delivers an indelible performance, but let me tell you it is a SSSSLLLLOOOWWW performance. The entire film is slow for that matter. You know how some senior citizens drive? Imagine that octogenarian behind the wheel about 3000 years older and 3000 years slower and you have it. For Universal Pictures, slow plot was familiar territory. The pace of Dracula was also notoriously droning, but as I said before The Mummy is nearly Dracula remade. 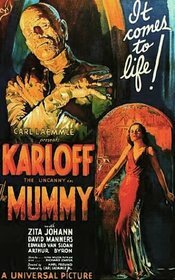 The Mummy was directed by Karl Freund, the genius cinematographer who filmed Metropolis and Der Golem in Germany before filming Dracula and Murders in the Rue Morgue for Universal. It has often been said that Freund's presence on the Dracula set was a stronger influence than that of its director Tod Browning. Freund's trademark liquid camera movements, although few, provided Dracula with some if it's highspots. The same camera work beautifully frames some of The Mummy, especially in the earlier scenes. Reunited with Freund were screenwriter Balderston, and actors David Manners and Edward Van Sloan. Manners and Van Sloan played nearly the same characters they did in Dracula and many of the scenes are nigh interchangeable between the two films. The villainous monsters also are very similar. They are both ancient, undead beings possessing great supernatural powers often used to manipulate those around them. Freund even uses a similar visual technique by casting light on the eyes of Karloff and Lugosi as they turn up the juice on their powers. One other common thread between the two films is the monsters' desires for the female leads, much to the chagrin of male lead David Manners. The motives for the monsters' desires however, are the largest differences. Regardless of how dubious his methods for winning her back are, Imhotep truly loved his princess. In that regard he is quite sympathetic, something you don't get from Count Dracula or Bela Lugosi. One of Karloff's most impressive gifts as an actor was the ability to elicit empathy. You can see in nearly every one of his performances frailty as strong as his menace. The Mummy is no exception. The shuffling bandaged image of the mummy however would not arise from this movie. Karloff only appears in bandaged mummy regalia for about three minutes in the beginning of the film. Even then we see only his face, hands and some of his torso. The rest of his time on-screen is spent in an extreme old age makeup, making this one of the only classic monster films to require two separate makeups for the same monster. It reportedly took over eight hours for Jack Pierce to apply the complete mummy makeup, which might be why Karloff, a full fledged movie star after the success of Frankenstein appeared in it so sparingly. Being billed as "Karloff the Uncanny" obviously had more clout than appearing as "?" in Frankenstein. Tom Tyler, the next to wear the mummy makeup, by comparison wears it throughout The Mummy's Hand. Just goes to show you what a little notoriety is worth in Tinseltown. The Mummy's success in 1933 solidified Universal Pictures hold on horror. It was the first film post-Frankenstein to bill Karloff as a star and it paid off. A slew of films for better or worse followed in Imhotep's monstrous footsteps. No longer was Universal an also ran studio. They had found a demand for horror films among audiences and for decades to come would be the prime supplier. While The Mummy would gently fade into the pantheon of classic monster films, its importance to the genre, to Boris Karloff and Universal Pictures would remain. If anyone were to ever carve a Mt. Rushmore of horror, Imhotep The Mummy would surely be in the Teddy Roosevelt position. A scene detailing all of Helen's past lives from Ancient Egypt to the present was excised at the behest of the Hays Office. This is why Henry Victor is credited as Saxon Warrior, even though neither the part nor the actor appear in the film. Submitted by Mr. Y (not verified) on Sat, 2011-04-23 11:11. If haave seen Dracula, The Mummy's Ghost, and The Mummy's Curse, would I like this one? Submitted by Ken Francis (not verified) on Sat, 2011-09-24 19:37. Absolutely. This is on a par with Dracula (I assume you're referring to the one starring Bela Lugosi and is vastly superior to the two Mummy films you mention. This is one of Boris Karloff's classic roles. If you haven't seen it yet, I highly recommend it. Submitted by maxfabien on Wed, 2011-10-12 06:21. 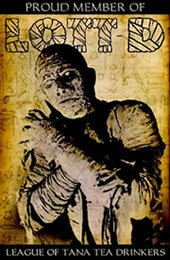 For me, "The Mummy" is the BESTof all the horror movies of the 1930's-40's era. When Universal released all its horror films to television in the late 1950's, I would watch them every Saturday night in Chicago on "Shock Theater". I was 7 years old, and I loved them all. But "The Mummy" was the only one that REALLY scared me. After watching it I was so scared that I refused to go to bed alone. My big brother had to go with me and stay with me until I fell asleep. Karloff at his frightening best, And the reaction of the young explorer when he sees the mummy come to life is terrifying and haunting. I never realized the similarities between "The Mummy" and "Dracula" until I read this review, it's very interesting. And it brought to mind another common thread in the two films. They both use "Swan Lake" for music playing over the opening credits. An unusual choice for a horror film, but in its own way, was very mood-setting and effective.